A grill is something that every household needs. It can come in handy whether you are looking to make a quick grilled cheese or get a full-blown barbecue going. Of course, the last thing that you want to do is spend all of your savings on a gas grill. This is why we have compiled a list of the best grills under $300. There are a few compromises that typically have to be made with cheaper grills, such as the life expectancy of these items. Nonetheless, we have striven to find the ones that offer you the best value for money and even boast quality. 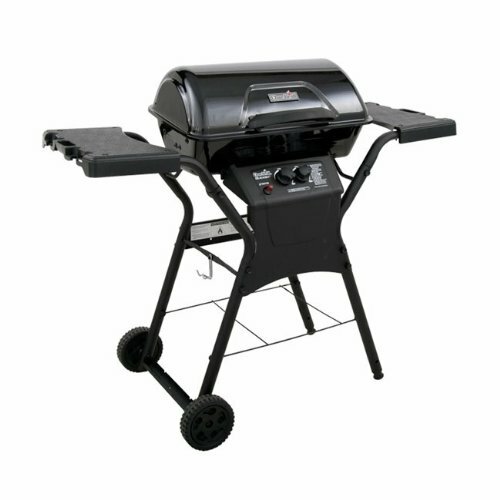 Not only is this grill way under the limit, it is also one of the highest selling grills too. Its portability, quality, and many features are precisely why it has landed on the top spot of the gas grills under $300 list. This is undoubtedly one of the most hassle-free grills on the market. It comes fully assembled so that from the minute you take it out of the box, it is ready to be used. It can be fueled by either a 14.1 or 16.4 oz. LP cylinder. With this, it is capable of producing 8500 BTU-per-hour. The electric ignition makes it easy to use while the infinite burner control valve allows you maintain the settings at a satisfactory level. This is the gas grill that you need if you have a large family as well as lots of space to work with. This grill does have four burners but each of them can be independently controlled. This means that you get to choose between low and high temperatures for optimal cooking. The flat top burner also gives you a greater choice when it comes to the items that you can cook on the grill. 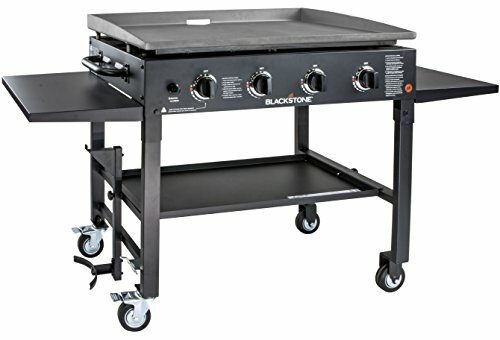 The Blackstone grill works on propane and while it does require a larger tank, this is easily stored underneath the grill. 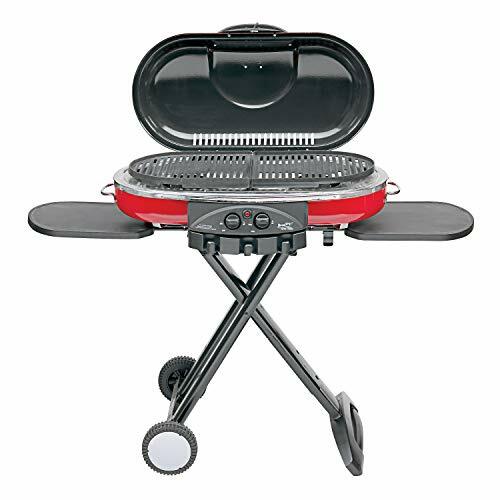 Despite its size, this grill can be easily wheeled from one place to another. Do you like to barbecue regardless of where you go? Then this Coleman grill is sure to excite you. One of the reasons that this model is considered one of the best grills under $300 is because although it is portable, it has ample space for grilling. In addition to the large grill space, there are also two side tables that you can use while cooking. It has an Instastart ignition which means that you don’t need to fiddle around with matches, even while you are cooking. This grill also has a PerfectFlow feature. This means that regardless of the weather, the propane will continue to flow to the grill to provide consistent heat. 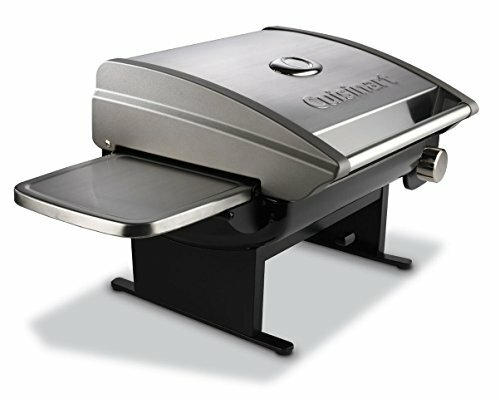 Cuisinart offers up some of the best kitchen appliances and this gas grill is no exception. It is a tabletop grill which ensures that it will fit almost anywhere. While it may be small, this propane-fueled grill is capable of producing 12,000-BTU. Regardless of what you are grilling, it will be grilled to perfection. The temperature gauge also allows you greater control over the temperature to make sure that the food will not get burnt. The ignition is twist start and therefore can be easily managed. There are two small shelves on either side of the grills to make it easier while you are grilling. If you are looking for a fully equipped gas grill, then the Dyna-Glo grill is the one for you. It works easily with any home. It is compact and does not take up a lot of space. There is also a place below the grill where you can safely store the gas cylinder, out of sight. This is a three burner grill which means that there is still plenty of space to grill for a larger crowd on special occasions. Also, the ignition, as well as the adjustable settings, means that your food is cooked to perfection each and every time. Last but not least, the grill is equipped with side shelves as well as a place for towels and even utensils. At first glance, this grill does look quite alien. It certainly doesn’t look any model you may have seen before. Nonetheless, there is a purpose to this odd design. This is to make sure that you get the most perfectly grilled food. It is capable of producing 21,000 BTU per hour. This means that within a span of five minutes, the grill can heat up to 500F. Not only does this lock in the flavor for whatever you are cooking, it also produces beautiful grill marks. The gas cylinder can be tucked away beneath the grill, making this model a great one to have if you experience limitations when it comes to space. 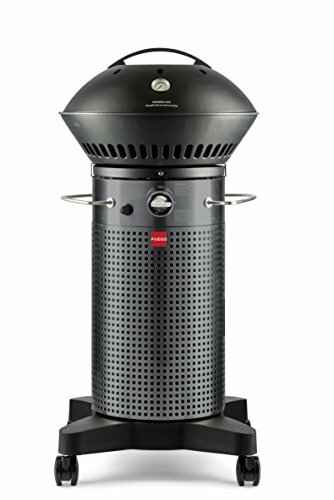 This is the cheapest grill on this list. However, you don’t really feel like you are missing out on anything. The only thing that you may have to contend with is the fact that the grill space is a bit smaller than most. You shouldn’t mistake this for a lack of power though as the grill can be fired up to 26,500 BTU. There are also shelves on either side of the grill so that you can have a fully equipped workstation. The settings for this grill can easily be adjusted. This makes it simple to turn on and ensures that the food is always being grilled at your preferred temperature. The two type of gas grills are natural gas grills and propane or LP grills. With natural gas grills, you have to have a natural gas source within your home. You will attach your grill to this source. Of course, this means that you grill must remain in one place and cannot be moved. These types of grills are also more complex to set up. Propane, on the other hand, is stored in cylinders. This means that your grill is portable as a result. Not to mention, it is easier to set up the grill as well. 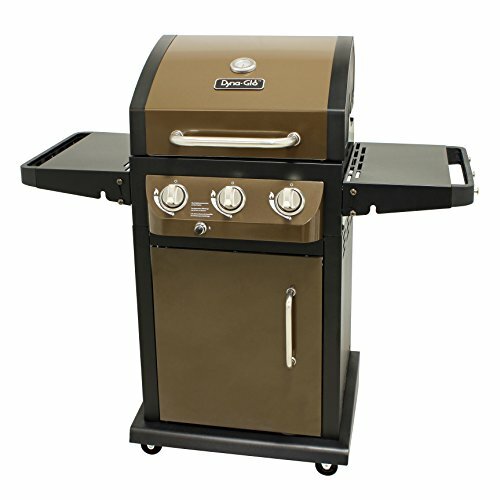 You will notice that the grills on the gas grills under $300 list are LP grills. This is because these models dominate the market. Cooking grid: the longer lasting grids will be constructed from either stainless steel, porcelain, or cast iron. It is important to ensure that the material is durable and heat resistant so that it will last for longer. Temperature: as you want your food to cook or grill properly, a certain temperature needs to be maintained. Ideally, the grill should be able to heat up to around 600F after a while. This is what will make for the best tasting steaks and burgers. Ratio between burner and grid: remember, the size of the grid is not indicative of the size of the burner. The burner should be of relative size to the grill. This is to make sure that the grill will be evenly heated throughout, without any cold spots. Materials used: especially at this price point, not all grills are very durable. As such, you may not be able to keep them outdoors at all times. The material that the grill is made from as well as the painting process used will give you a lot of information regarding how much it can withstand. If a grill is not explicitly labeled as being weather resistant, it is best not to leave it outdoors. Extra features: each grill is different so you should keep an eye out for any additional features. This could be shelves flanking the grill, a place to put utensils, or even additional burners. This will all add value to the grill. Now you know what your options are regarding gas grills, if you don’t have a lot of money to spend. You no longer have to be left out of the grilling and barbecuing experience.